Before posting large media files onto your blog or website you should consider the best means of transferring from the server to your readers. Large HQ video and image files will take up a lot of space on your server. This also means that they require loads of bandwidth to push out to everyone. Images are much smaller than audio/video but all media files over a certain size can slow down the webpage. So what are the best ideas for publishing media on your website? I have just a few thoughts worth sharing on this topic. I feel that anyone who runs their own website must run into problems with handling media. Plain text does not always cut it and sometimes you’ll need to illustrate things beyond the page context. This alternative is not great for everybody however it is always an option. Content Delivery Networks are just servers which are physically located all over the world. 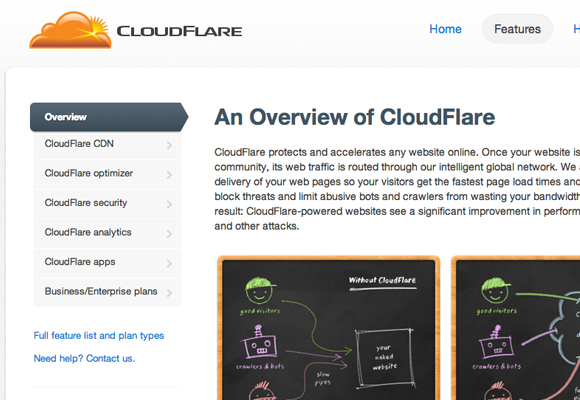 CloudFlare is one of the most popular options and they provide servers located in almost every country on Earth. The reasoning behind this technology is to quickly deliver copies of your media to anyone on the planet. Users who are in China or Romania can get a much quicker connection into the local CloudFlare server, rather than accessing your website’s single server. The latency is a lot smoother and it’s more noticeable when users are streaming video or audio files. The biggest problem with using a CDN is the price cost. Unless your website is earning money and really needs to offload some of the hosting, CDNs may just be too expensive. The alternative would be using a free hosting service like YouTube or 4shared but this means you are not in control over the file management. If you cannot afford to lose quality in your files then why not consider replacing them in the page with a thumbnail? Visitors will be presented with a small preview image from your larger photo or video file. In this scenario your pages will load much quicker because the stream of data is smaller. Also your visitors will be in full control over whether they want to stream a video or not. The same options apply for audio streaming and clicking a thumbnail to view the full-sized image. Previews are the best workaround for handling high-quality media because you are giving the option to connect with the larger file sizes. Plus with so many open alternatives for sharing music and video there really isn’t a whole lot to worry about. You should consider these techniques and offload your bigger files whenever possible. Unless your web server can really handle large influxes of traffic, it is reasonable to think that YouTube or Vimeo can handle your video streaming better. Same goes for audio files on SoundCloud or any other related network. Do not be afraid to try new ideas and eventually you will find your preferred method for dishing out website media over the Internet.